Canon USA published a press release discussing the availability of three professional lenses. One of those included, the Canon EF 200-400mm f/4L IS is the zoom I've wanted for years. "The EF 200-400mm f/4L IS USM EXTENDER l.4x is being developed as an L-series super-telephoto lens with an integrated 1.4x extender and high-performance Image Stabilizer technology. The new lens will offer exceptional flexibility by incorporating a built-in 1.4x extender that increases the maximum focal length to 560mm for sports and wildlife photography. High-quality images with high levels of resolution and contrast will be possible through the use of advanced optical materials such as fluorite crystal. The new lens will also include dust- and water-resistant construction designed for extended usage under harsh conditions." What a wonderful complement to my 70-200mm f/2.8 IS. Of course this beast will be pricy. And there still isn't a release date for it. But I'm happy to get confirmation that my dream lens will someday be a reality. Professional travel photographer and teacher Rick Sammon is conducting a free webinar on Nov. 17, 12:00 - 1:00 PM PST. You can reserve your seat now by pre-registering. I've learned much from Rick over the years (he's a good friend of mine), and I think you will too. Our crew of photographers wrapped a full day of classroom instruction and shooting on Saturday during the November TDS Aperture Workshop. One of three model shoots on Saturday that will provide fresh content for the image editing modules on Sunday. For today, which is the second session of the event, we'll use the portraits we shot yesterday for the image editing modules where we perfect basic adjustments, such as color correction, plus advanced techniques such as skin smoothing, brush work, and more. We'll also make prints today with the Epson R2000 photo printer. The day will wrap up with professional slideshow authoring where we combine video and stills to create presentations that can be published online or viewed in person. Currently we have two Aperture Intensive workshops in the 2012 schedule. You can learn more about them, and the other events, by visiting the TDS Workshops page. Apple released Digital Camera RAW Compatibility Update 3.9 that provides support for 11 new cameras, including the Canon S100, Nikon 1, Sony NEX 5N, and the new Olympus PENs. It's available via Software Update on your Mac. New Yorker hotel shot with an Olympus E-PM3 (Mini) in Raw and processed in Aperture 3. Click on image for larger size. Photo by Derrick Story. 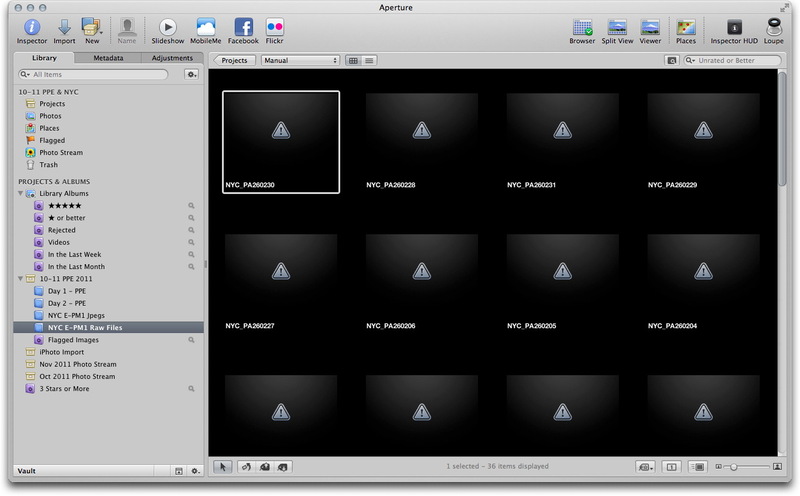 This means that Raw files from the following cameras can now be processed in Aperture 3, iPhoto 9, and Preview for Mac OS X Lion. To fully processed images that look like this. All I have to do is open the Adjustments tab, and click on the thumbnail. 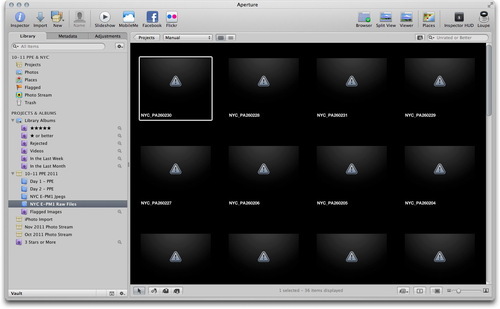 Aperture will automatically process the Raw file for you, once you have the update installed. The workflow that I recommend for photographers who buy new cameras that are not supported yet in Aperture, is to shoot Raw+Jpeg in the beginning. 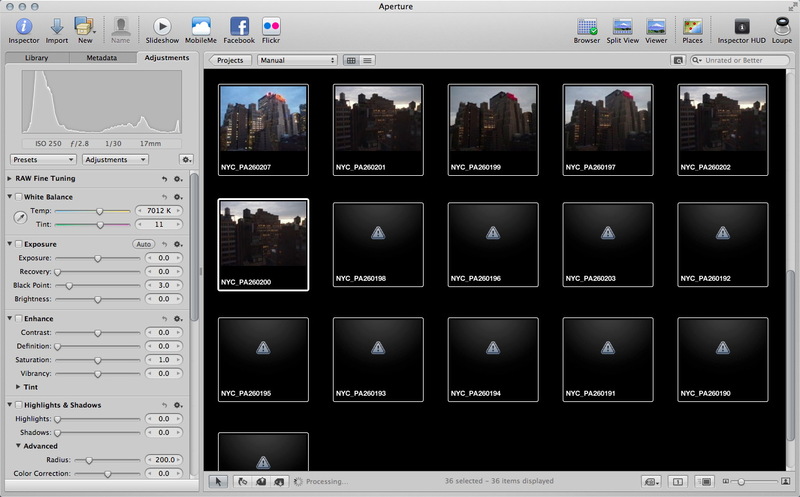 Upload the Raws and Jpegs separately in Aperture and keep the in separate Albums, as I've done here. (Check the Library pane in the middle illustration to see the set up.) You can use the Jpegs immediately. Once the Raw update is available, you can then process the Raw files and switch over to them. I've taken many good shots with the E-PM1 prior to the Raw update. If I didn't use this technique, I'd have only Jpegs from those weeks of shooting. Now I have both. 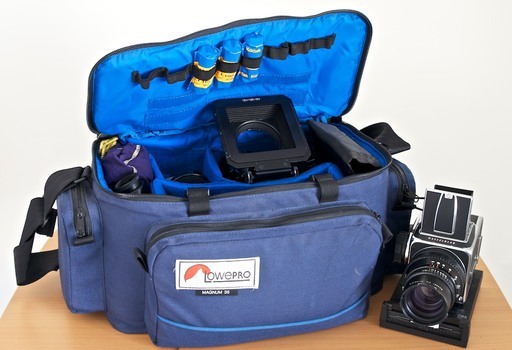 What's Your Tripod Mount Preference: Ballhead, Pan or Hybrid? I ran across this article, Panheads Vs Ballheads, and it got me thinking about how my preferences for tripod mounts has swung back and forth over the years. First of all, I do use tripods. Don't necessarily love them, but they are required for many of the shots I take. I began using panhead mounts because they were easy to use. But those darn handles sticking out moved me over to ballheads for hiking and other outdoor activities. Then video came along... and panheads are so much better for movie making. Or I should say, the ability to pan is what's required. That need led to some good moments with Joby's Ballhead X. It provides the convenience of a traditional ballhead, yet gives me a separate knob for panning control. Plus, the clamp and plate are Arca-Swiss system compatible. 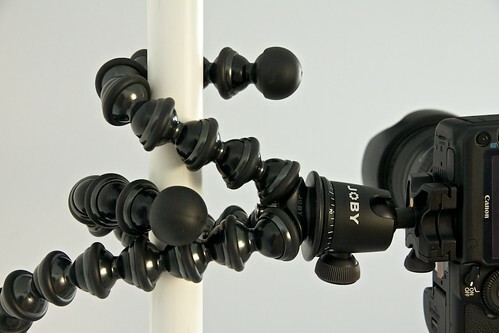 (You can get the Ballhead X by itself for $47 or in combination with the Gorillapod Focus for $113, as shown in the illustration.) Then there are other days where I go with the monster Bogen aluminum tripod with ginormous panhead. I guess I'm not a "one tripod kind of guy." So where do you stand? Panhead, ballhead, or hybrid? This is just for fun, but it does make a difference when you have a job to do. Michelle Vinay will be the featured model this weekend for the Aperture Intensive Workshop in Santa Rosa, CA. Attending photographers will have three sessions with Michelle to build fresh content for their Aperture library. We will then use those photographs for our image editing tutorials where attendees will learn portrait techniques such as skin smoothing, blemish retouching, color adjustment, and more. Michelle will be available for feedback as students work on images of her. I know she's looking forward to working with our TDS photographers. If you'd like to treat yourself to a photography intensive, take a look at our TDS Workshops page and peruse the schedule for 2012. There's a sign-up form available too. And if you're in Northern California this weekend, consider joining the Aperture Intensive workshop. We're going to have a great time! Some people vow to shed weight or drop an undesirable habit when the New Year rolls around. 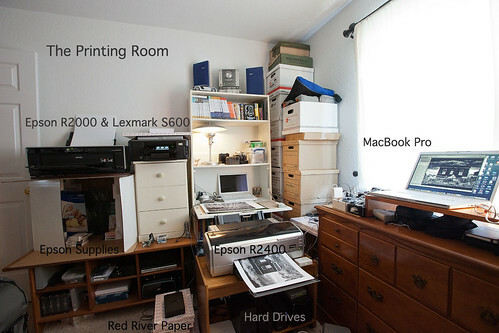 As 2012 approaches, I think this is also a great time to fine tune your photo organization and backup plan. When I recorded my lynda.com title, Organizing and Archiving Digital Photos, I always had the New Year in mind. The most important concept is "Start where you are." 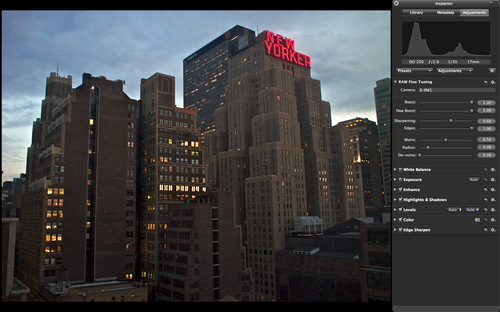 What I mean by that, is build your improved system for 2012, then start using it for the new pictures you take. At first, don't worry about all those other images from previous years. Once you get the new system fine tuned with a manageable amount of photos, you can begin to bring in the old stuff a chunk at a time. By taking the "start where you are" approach, you won't overwhelm yourself or your new system while you're still working out the kinks. This prevents frustration, and will give you better odds of success. 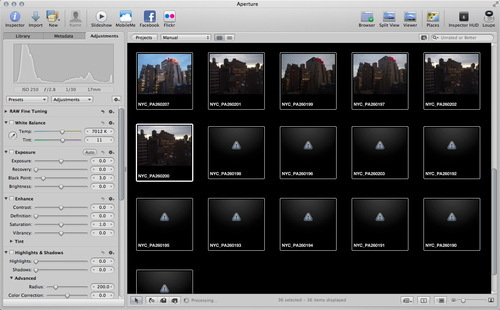 As for creating the system itself, take a look at Organizing and Archiving Digital Photos for some new ideas. If you start building your plan now, you should be ready to implement it on Jan. 1, 2012.